Harmful conflict is usually triggered by unmet desires. “What causes fights and quarrels among you? Don’t they come from your desires that battle within you? You want something but don’t get it” (James 4:1-2). Even good desires can evolve into controlling demands or idols that lead us to judge others and then avoid or punish them until we get what we want (see Luke 10:38-42). This progression often starts with minor differences, but before we know it we’re sliding down a slippery slope of conflict that can drop off in two directions—ESCAPE RESPONSES and ATTACK RESPONSES. People tend to use escape responses when they are more interested in avoiding unpleasant people or situations than in resolving differences. DENIAL—One way to escape from a conflict is to pretend that a problem does not exist. Another way is to refuse to do what should be done to resolve a conflict properly. These responses bring only temporary relief and usually make matters worse (see 1 Sam. 2:22-25). FLIGHT—Another way to escape from a conflict is to run away. This may take the form of pulling away from a relationship, quitting a job, filing for divorce, or changing churches. Flight may be legitimate in extreme circumstances (see 1 Sam. 19:9-10), but in most cases it only postpones a proper solution to a problem. SUICIDE—When people lose all hope of resolving a conflict, they may seek to escape from the situation (or make a desperate cry for help) by attempting to take their own lives (see 1 Sam. 31:4). Suicide is never a right way to deal with conflict. getting their way than in preserving a relationship. ASSAULT—Some people try to overcome an opponent by using various forms of force or intimidation, such as verbal attacks (including gossip and slander), physical violence, or efforts to damage a person financially or professionally (see Acts 6:8-15). Such conduct always makes conflict worse. LITIGATION—Although some conflicts may legitimately be taken before a civil judge (see Acts 24:1-26:32; Rom. 13:1-5), lawsuits usually damage relationships, diminish our Christian witness, and often fail to achieve complete justice. This is why Christians are commanded to make every effort to settle their differences within the church rather than in the civil courts (see 1 Cor. 6:1-8; Matt. 5:25-26). MURDER—In extreme cases, people may be so desperate to win a dispute that they will try to kill those who oppose them (see Acts 7:54-58). While most people would not actually kill someone, we still stand guilty of murder in God’s eyes when we harbor anger or contempt in our hearts toward others (see 1 John 3:15; Matt. 5:21-22). The key to changing the way we deal with conflict is the gospel, the good news that God made peace with us and between us by sending his Son to die for our sins and give us new life through his resurrection (Col. 1:19-20; Eph. 2:14-16). When we believe in Jesus, we receive forgiveness and are united with Christ and one another (Acts 10:43; Phil. 2:1-2). God then begins to transform us into the likeness of his Son, enabling us to break free from sinful escaping and attacking habits and mature into peacemakers who reflect the glory of God’s reconciling love in the midst of conflict (2 Cor. 3:17-18; Col. 3:12-15). Peacemakers are people who breathe grace. Inspired by the gospel, they draw continually on the goodness and power of Jesus Christ, and then breathe out his love, mercy, forgiveness, and wisdom to dissipate anger, improve understanding, promote justice, and model repentance and reconciliation. PERSONAL PEACEMAKING: There are three biblical ways to resolve conflicts personally and privately, just between you and the other party. 1. OVERL OOK AN OFFENSE—Many disputes are so insignificant that they should be resolved by quietly overlooking an offense. “A man’s wisdom gives him patience; it is to his glory to overlook an offense” (Prov. 19:11). Overlooking an offense is a form of forgiveness, and involves a deliberate decision not to talk about it, dwell on it, or let it grow into pent-up bitterness or anger. 2. RECONCILIATION—If an offense is too serious to overlook or has damaged our relationship, we need to resolve personal or relational issues through confession, loving correction, and forgiveness. “[If] your brother has something against you…go and be reconciled” (Matt.5:23-24). “Brothers, if someone is caught in a sin, you who are spiritual should restore him gently” (Gal. 6:1; see Matt.18:15). “Forgive as the Lord forgave you” (Col. 3:13). 3. NEGOTIATION—Even if we successfully resolve relational issues, we may still need to work through material issues related to money, property, or other rights. This should be done through a cooperative bargaining process in which you and the other person seek to reach a settlement that satisfies the legitimate needs of each side. “Each of you should look not only to your own interests, but also to the interests of others” (Phil. 2:4). ASSISTED PEACEMAKING: When a dispute cannot be resolved personally, God calls us to seek assistance from other believers. 1. MEDIATION—If two people cannot reach an agreement in private, they should ask one or more objective outside people to meet with them to help them communicate more effectively and explore possible solutions. “If he will not listen [to you], take one or two others along” (Matt. 18:16). 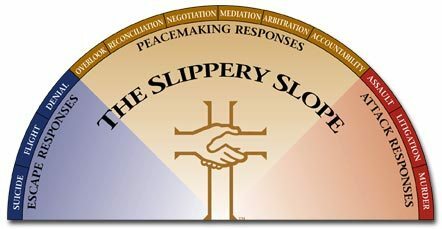 The mediators may ask questions and give advice, but the parties retain the responsibility of making the final decision on how to resolve their differences. 2. ARBITRATION—When you and an opponent cannot come to a voluntary agreement on a material issue, you may appoint one or more arbitrators to listen to your arguments and render a binding decision to settle the issue. “If you have disputes about such matters, appoint as judges even men of little account in the church” (1 Cor. 6:4). 3. ACCOUNTABILITY—If a person who professes to be a Christian wanders from the Lord by refusing to be reconciled and do what is right, Jesus commands church leaders to lovingly intervene to hold him or her accountable to Scripture and to promote repentance, justice, and forgiveness. “If a man owns a hundred sheep, and one of them wanders away, will he not … go to look for the one that wandered off? … If he refuses to listen …, tell it to the church” (Matt. 18:12,17). As people reconciled to God by the death and resurrection of Jesus Christ, we believe that we are called to respond to conflict in a way that is remarkably different from the way the world deals with conflict (Matt. 5:9; Luke 6:27-36; Gal. 5:19-26). We also believe that conflict provides opportunities to glorify God, serve other people, and grow to be like Christ (Rom. 8:28-29; 1 Cor. 10:31-11:1; James 1:2-4). Therefore, in response to God’s love and in reliance on his grace, we commit ourselves to responding to conflict according to the following principles. By God’s grace, we will apply these principles as a matter of stewardship, realizing that conflict is an opportunity, not an accident. We will remember that success in God’s eyes is not a matter of specific results, but of faithful, dependent obedience. And we will pray that our service as peacemakers will bring praise to our Lord and lead others to know his infinite love (Matt. 25:14-21; John 13:34-35; Rom. 12:18; 1 Peter 2:19; 4:19). Instead of focusing on our own desires or dwelling on what others may do, we will rejoice in the Lord and bring him praise by depending on his forgiveness, wisdom, power, and love, as we seek to faithfully obey his commands and maintain a loving, merciful, and forgiving attitude (Ps. 37:1-6; Mark 11:25; John 14:15; Rom. 12:17-21; 1 Cor. 10:31; Phil. 4:2-9; Col. 3:1-4; James 3:17-18; 4:1-3; 1 Peter 2:12). Instead of blaming others for a conflict or resisting correction, we will trust in God’s mercy and take responsibility for our own contribution to conflicts— confessing our sins to those we have wronged, asking God to help us change any attitudes and habits that lead to conflict, and seeking to repair any harm we have caused (Prov. 28:13; Matt. 7:3-5; Luke 19:8; Col. 3:5-14; 1 John 1:8-9). Instead of pretending that conflict doesn’t exist or talking about others behind their backs, we will overlook minor offenses or we will talk personally and graciously with those whose offenses seem too serious to overlook, seeking to restore them rather than condemn them. When a conflict with a Christian brother or sister cannot be resolved in private, we will ask others in the body of Christ to help us settle the matter in a biblical manner (Prov. 19:11; Matt. 18:15- 20; 1 Cor. 6:1-8; Gal. 6:1-2; Eph. 4:29; 2 Tim. 2:24-26; James 5:9). Instead of accepting premature compromise or allowing relationships to wither, we will actively pursue genuine peace and reconciliation—forgiving others as God, for Christ’s sake, has forgiven us, and seeking just and mutually beneficial solutions to our differences (Matt. 5:23-24; 6:12; 7:12; Eph. 4:1-3, 32; Phil. 2:3-4). I will not dwell on this incident. 2. I will not bring this incident up and use it against you. 3. I will not talk to others about this incident. 4. I will not allow this incident to stand between us or hinder our personal relationship. ©2009 Peacemaker® Ministries. All rights reserved. Scripture quotations are from the New International Version. ©1973,1978, 1984 International Bible Society.